There has been mucho potty (training) progress in my home over the past few weeks. I can confidently send my 3 year old to school or take him out for the day without having to worry about accidents or bringing pull-ups for just in case. I’m not quite sure how it came together really…I had to be tough on him as far as diligently asking him to go and sometimes even physically taking him to go, but 9 times out of 10 these days he is taking the initiative to go himself. And — after a few weeks of seeing him stay pretty dry at school, one day I said let’s just go for it and leave him in his underwear. Thankfully it worked and since then I haven’t worried too much about his potty habits, he just KNOWS what to do. I started potty training with him a while ago…first we got a potty so he would get used to seeing it in the bathroom, did that sometimes after he hit the 18 month mark. Then, we started a routine where he would use the potty everyday at least once before bedtime… When I really wanted to ramp it up, I semi-tried having a weekend where we stayed home and focused on just using the potty. That is easier said than done, especially since I have another younger toddler running around. Then, with his 3 year birthday approaching, I thought to myself…when is this ever going to happen. I had enlightened “Potty Perspective,” but at this point he knew what it’s for and what he is supposed to do, but chalk it up to being lazy or whatever, he just wasn’t quite there. I will advocate for the experts who advise against forcing the issue and rather letting them take control when they are ready. Ready is so key…and potty training parents have to be careful because you truly do not want regression! 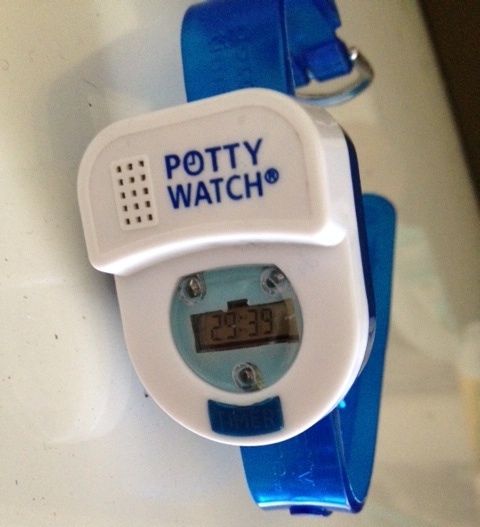 BTW..I also invested in a potty watch which was great for the first 24 hours, but after that he just loved hearing it sound off as a reminder, but he wouldn’t follow it’s guideline for going to the potty. I think it’s an excellent device for a child that will adhere to the rule of going potty when the “alarm” goes off..but that is not my child. Now, in the end it’s all about teaching them and guiding them to the potty, but not pushing them too hard. The past few nights he’s stayed dry all night – using an overnight diaper, so my next step will be to take the plunge and let him go commando while he sleeps…eek!! It’ll be fine though, right? I should expect some cleanup and off course cover the mattress with waterproof protectors and even pad it with an extra overnight pad….hehe! The point is, I can say with confidence my boy is potty trained and there’s no turning back! The focus now shifts to making sure he doesn’t “wait” to go. Disney’s “Nina Needs to Go” is really cute for getting that point across to the kids, he’ll also have to learn how to wipe and then hopefully controlling his aim!! LOL!! And — of course there’s lil bro who still needs to learn, but it’ll be easy, right? He’ll just copy big brother…wish me luck!